On Friday 14 May 1965, a meeting was held in the Bayswater Public Hall where it was decided that a Shire of Knox Historical Society should be formed. 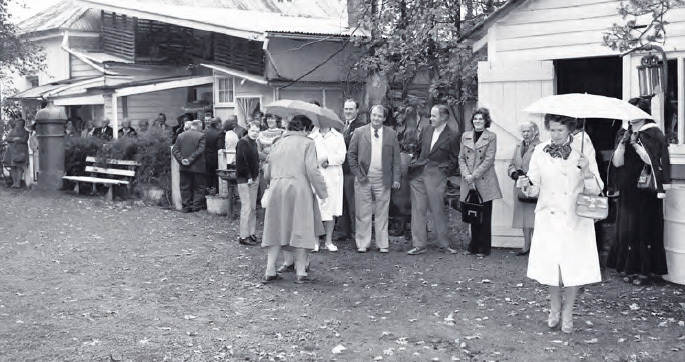 The beginnings were humble as the Society initially operated from members’ homes and a barn house on Ferntree Gully Road. Fifty years later, what started as a small group of residents concerned about preserving Knox’s history has grown into one of our most important and influential local societies. Today the group operates from Ambleside Park in Ferntree Gully, and is home to Knox’s most extensive archive of historical artefacts, photographs and documents. It also operates Knox’s only accredited museum with displays and exhibits that are open to the public. They also host regular school group talks and presentations, and have compiled a vast library of publications that tell the story of our city. Today Graham Hansen and a dedicated committee oversee the society, and do some tremendous work in keeping the story of Knox alive. Clearly our history is in safe hands. To celebrate their 50th Anniversary the society is hosting a celebratory lunch at The Knox Club on Sunday 13 September. Guest speakers will include Karin Orpen and Bill McAuley. Members of the public are invited to book their tickets for this event by contacting the Society on 9758 6722. Interchange Outer East transforms lives. We provide opportunities for children, young people, families, volunteers and staff to have a range of experiences through which they can thrive. Our primary focus is to support children who have a disability and their families, but that’s just the start of it! Whether it’s a young child with a disability going on their first overnight camp, a young adult travelling to Italy, a teenage volunteer being responsible for another person, a mum connecting with other mums, a family having their first holiday on family camp, or a staff member running a day activity – many, many experiences are available. These transformation opportunities are backed by a culture that values people as being more important than anything else. A pragmatic approach to rules and regulations, a maxim to make things work and solve problems rather than avoid them, and a desire to do the best we can. We provide services in Melbourne’s outer eastern region for over 850 families who have a child with a disability. We have 313 registered volunteers, aged from 14 years up. We have serviced the outer eastern region of Melbourne, covering the Knox, Yarra Ranges and Maroondah local council areas for over 30 years. Interchange Outer East programs include 1:1 flexible support, school holiday program, family support comprising mums, dads and siblings programs, youth groups, adult and children’s recreation, adult day service and post school options and international travel for all ages. Based in Yose Street Ferntree Gully, we also have sites at Station Street in Ferntree Gully, Bayswater and Lilydale. Come in and say hi, meet the staff, volunteers and participants and find out what we’ve been up to. We work with all areas of the community to create opportunities for people. We are always on the look out for new ways to connect with the local community, and we ask community organisations, clubs, businesses and individuals to contact us if they would like to explore ways in which we can work together to make Ferntree Gully, Knox and the wider community a more connected, inclusive place. family hosting a child for one weekend a month – the possibilities really are endless. Volunteering with Interchange Outer East is a unique and life changing experience. 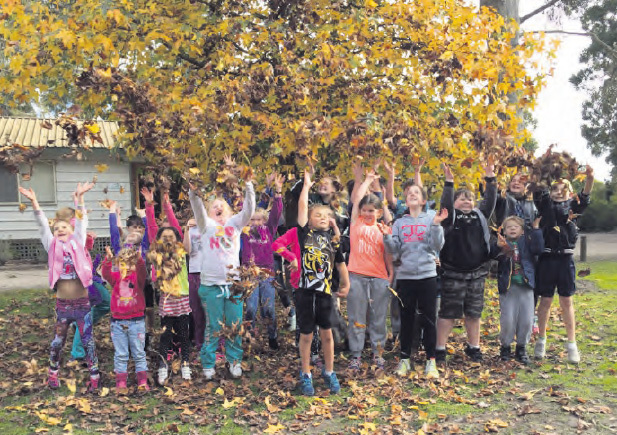 Our youth volunteer program is setting the standard for young people in the area. If you volunteer with us, you will be accepted, you will make friends and make a genuine difference in many lives – and there’s one other guarantee – you will have fun. To find out more about Interchange Outer East, please visit the website at www.ioe.org.au and don’t forget to ‘like’ the Interchange Outer East page on Facebook to stay up to date with all the latest news and events. 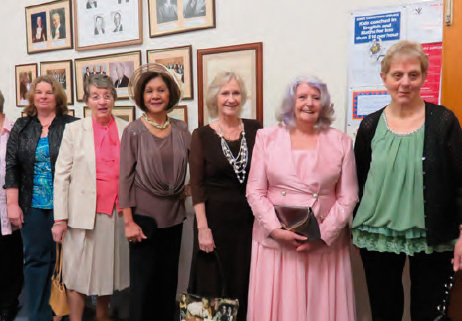 The Angliss Hospital Ferntree Gully Auxiliary held their annual Winter Fashion show of pre-loved garments in the Freemasons hall in Station Street. 92 year old Marjorie as always was a delight and a big hit with everyone. New model Faye was very nervous but she did well too. The show was not all high fashion for ladies. Gwen modelled night wear carrying her teddy bear along the catwalk. Sam Broughton from Eastern Health modelled an outfit of men’s clothing from the collection. The Auxiliary are well known for this annual event. The Gully show was followed by a booking with the Over 40’s Social Club of St Paul’s Anglican Church. Denise concluded, ‘For me, it is a privilege to know and work with such a lovely bunch of people, who all want to raise money for our wonderful Angliss Hospital’. 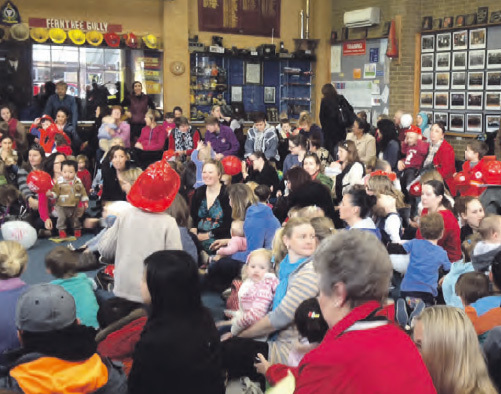 On Friday morning, 19 June, Ferntree Gully Fire Brigade in conjunction with the Ferntree Gully Eastern Regional Library, held their fourth ‘Fun Story Time’ at the Ferntree Gully Fire Station. At each of these Fun Storytime days at the fire station, the number of children, parents and grandparents attending increases beyond expectations. More than 140 children and 120 adults were present at the last event. Feedback to the Brigade has been extremely positive. ‘fire safety message’ by presenting short but important messages to the mums, dads and grandparents present. The events also assist the community to understand the important role the volunteer fire brigade plays in the community and makes the community feel comfortable being in what is in effect their fire station. One mother left a message on the CFA website thanking the volunteer firefighters, the library staff and even Rusty Arnold the Bear, for holding the storytime and saying how much fun she and her daughter had. The CFA says a huge ‘thank you’ to library staff Sue Wootten and Trudy and to the children and parents of the community for making this event so successful. garden lawns quickly turned to mud. A glimpse of soldiers, in World War One uniforms, splashing through mud, brought to mind all those photos of Flanders mud. The occasion was the first of many ceremonies that will mark the centenary of the First World War, declared on 4 August 1914. By 1 November the first convoy of enthusiastic enlistees sailed from Albany in Western Australia for the Middle East. The focus of Saturday’s ceremony was the redesigned War Memorial to all those who served their country from what is now the City of Knox. 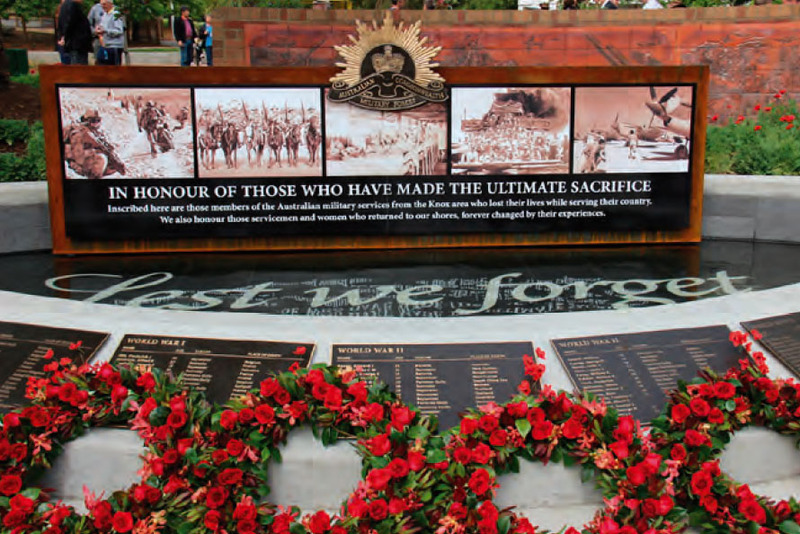 A feature is the new Honour Roll of bronze plaques listing the names of those who died in service. The former Governor General, Major General Michael Jeffery gave the keynote address and placed the first of the many wreaths. Federal MP for Aston Alan Tudge read the roll of names while Pipe Major Mark Saul played the lament. The catafalque party was from HMAS Cerberus. In his speech Mr Tudge thanked all those who had worked for the last two years to bring about the new memorial and this centenary event. There was special mention of the families of Sergeant Brett Wood MG DSM and Private Benjamin Rinaudi who died fighting in Afghanistan. Guests included many returned soldiers, often accompanied by young family members. and the many forthcoming commemorations of the centenary, will give pause to any acceleration of conflict between nations today. May those who have died rest in peace and may we learn to bring peace not war out of our differences. The Neighbourhood Houses of Knox have formed a partnership to deliver the new volunteer resource centre services for the City of Knox from July 1st, 2014. The head office for Volunteer for Knox is at Coonara Community House; 22 Willow Rd, Upper Ferntree Gully. To contact the Volunteer for Knox staff, you can email office@volunteerforknox.com.au or phone 0429 968 822. 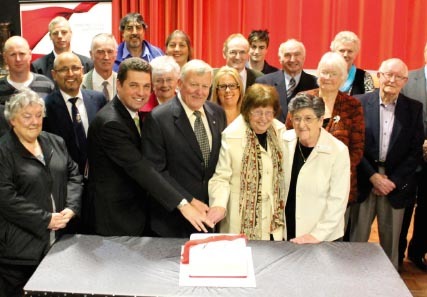 On Tuesday 1 July, State Member for Ferntree Gully, Nick Wakeling MP, hosted the seventh annual Ferntree Gully Electorate Victoria Day Awards. Assisting Mr Wakeling was Mr Hurtle Lupton, Chairman of the Bendigo Community Bank – Fern Tree Gully and Rowville Branches, major sponsors of the awards ceremony. The Victoria Day Awards are a wonderful opportunity for our local community and sporting groups and volunteer organisations to recognise, celebrate and thank an exceptional member of their organisation who make a significant difference to our community with their outstanding service and commitment. For 2014, Mr Wakeling presented awards to 31 inspirational and worthy individuals. One such recipient was the newspaper’s own Distribution Manager, Jenny Ford, whose organisational skills, and attention to detail have ensured the effective and timely distribution of our newspaper over the past five years. Jenny was nominated by the Mountain District Learning Centre. MDLC Manager Janet Claringbold and Executive Committee Chair Chris Markwick were present at the function. After an introductory speech by local State member, Mr Nick Wakeling, the presentations were made by Hurtle Lupton, the CEO of the Ferntree Gully Community Bank, Bendigo Bank Ltd. After the presentations, recipients and their guests were invited to partake in refreshments. On behalf of the community of the Ferntree Gully electorate, Mr Wakeling would like to congratulate all nominees and thank them for their amazing, varied and selfless contributions to our community. Mr Wakeling would also like to thank the on-going support of the Victoria Day Awards major sponsor – Bendigo Community Bank – Fern Tree Gully and Rowville Branches and also welcome a new sponsor – Good Life Wholesale Party Foods in Wantirna. The first Volunteer Expo for FTG looks set to become a regular event. Organisers and stallholders were surprised and delighted at the enthusiastic response from nearly 200 visitors. The Expo was organised by Mountain District Learning Centre (MDLC), sponsored by the Bendigo Community Bank, and held in Volunteers Week at the Knox Community Arts Centre on Burwood Highway. About 25 community organisations, mostly Gully locals, booked stalls and set out displays of what they do. The aim of the event was to invite new volunteers and MDLC was not disappointed. (Ferntree Gully News has offers of 6 new walkers.) To judge by the buzz of lively chatter all day, visitors and stallholders alike took a lively interest. Another unexpected benefit was the networking between the organisations exhibiting. People swapped ideas, promised loans of equipment and shared success stories. It was networking at its best. The Expo was opened by Dobson Ward Councillor, Karin Orpen, who praised the work done by the organisations and expressed her pride in the strength of community in the Gully. 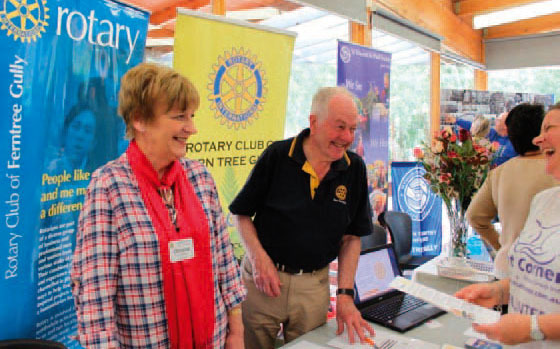 Knox Council’s Volunteer of the Year, April Himmelreich spoke about the benefits to be had from volunteering and MP for Ferntree Gully Nick Wakeling chatted with stallholders. Refreshments were provided by Inner Wheel, a section of Rotary.